As we humans settled down, started to cultivate the earth and become domiciled other rites and festivities started to develop. It was harvest, fertility, initiation or transition rites among other. Those rites demanded more human masks, representing human types such as farmers, youth, age, men and women for example. Most of those rites were religious and some of the masks moved in to the mysterious. They started to represent Gods, heroes, demons, spirits and so on. 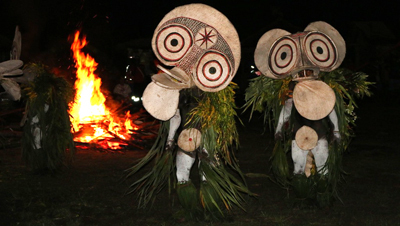 This is also when those masks started to be worn specifically by the shamans or other actors. The masks were acted out for an audience in order to serve a purpose, instead of being a part of the playful game of telling about the hunt (See Part 1). When the masks got more specified the plots started to develop as an effect. What had been more of ritual revels or dramatic rituals turned into more dramatic exercises or even primitive emergent masked plays with a clear storyline. Even though the plots and the masks got more particularized and refined the mask is always a type. It always is representing something more than an individual person. It is always more than just itself. It can be a kind of people, a God, an occupation, a gender and so on. Just like Pantalone is certainly a specific person with his own characteristics, but he also represents the patriarch, old age, and the old lecher – all in one. It is the exaggeration of the masks that makes him more than just himself. Consequently masks are derived from hunters mimicking their prey. They become human in rites that first came from the joy of narrating, then in religious and other rites. The humanization gave the rites more of a storyline, which demanded more defined characters of the mask. But the masks still stay a type, like Arlecchino, Santa Claus, Batman or Moomin, not a psychological person. All masks everywhere have their origins in animal masks. This entry was posted in Mask theatre and tagged bird mask, blog, blogg, buffoon, buffoons, carnival mask, carnival masks, character masks, clown, clowns, comedy, commedia, Commedia dell arte, facemask, facemasks, fixed masks, fools, hunting mask, Klingvall, Kompani Komedi, Kulturama, larval masks, leather masks, mask, mask teacher, masks, Micke Klingvall, physical theatre, rite, rites, rituals, scandinavian theatre, Teaterstudion, theatre, theatre education, theatre school, theatre student, theatre teacher, vulgar, vulgar comedy, women in mask. Bookmark the permalink.